I tasted some superb wines while in the Cape but the most memorable was Bosman Family Vineyards Pinotage 2009. 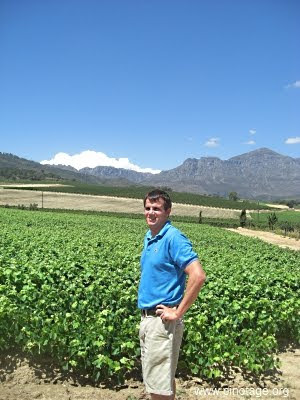 Bosman is the winemaking arm of the long established Lelienfontein vine nursery owned by eight generation Jannie Bosman. Their impressive property has terrific views over vineyards to surrounding mountains. Fields contain the bright green growth of new vines sticking out the ground pencil thin and a foot high, planted inches apart and destined to be plucked packed and despatched to the vineyard that ordered them 18 months in advance. There are also established vineyards growing a range of varieties, some such as Primitivo (from Puglia) and Nero d'Avola (from Sicily) that are not found as varietals in South Africa, yet d’Avola grows well, says cellar master Petrus Bosman. Until recently grapes were sold on and vine rows leased to various wineries. Coloured tapes at the end of rows indicate ownership and there’s a monetary definition of terroir -- that rather nebulous concept of place. Here neighbouring rows can cost different rates to lease as one produces better grapes than another. Maybe it’s the position on the curve of a hill, one gets more sun another just below the brow is sheltered from wine. Terroir has a value set on it. I was grateful to Petrus for showing me his foundation nursery where new vine varieties are produced. 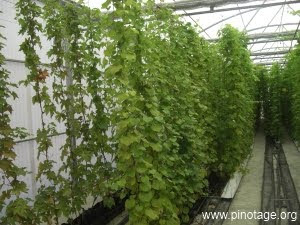 This is a large temperature controlled greenhouse entered via an airlock where foundation vines are grown hydroponically in sterile conditions. The vine grows up, supported by wires from the ceiling and is not pruned. Canes thrown out will be cut and in turn grown to produce virus free mother block vines. These will be planted in remote areas to in turn produce cuttings for vines for commercial use. Because wine drinkers are conservative, preferring to drink, in most cases, varieties grown for hundreds of years none in the greenhouse were meant for wine. Instead there were new varieties of table grapes, grapes destined for drying and American vines for rootstocks. 2010: This was still in barrel, French oak, some 500 litre capacity. Soft and fruity with underlying coffee, it’s a work in progress and will have more oak aging to further refine it. 2009: This had been bottled but was not yet labelled, undergoing bottle aging before release. On the nose it had a hint of coffee and in the mouth it was a sensation being big, round full and galumphing offering sweet ripe bramble berry fruits and with a racy exciting finish. Corlea said 2009 had been a late vintage and Petrus added that he grows Pinotage on a west facing slope to get the afternoon sun. He says Wellington is a superb location for Pinotage. This wine was aged 14 months in 225litre barriques, 60% French and 40% American oak. I was absolutely knocked out by this fantastic wine. 2008: This was a more subdued version of the 2009, drier and more tannic with a slight underlying coffee flavour. An excellent wine, but the 2009 had taken all my superlatives. Vintage was underway and Corlea was in her working clothes but I managed to persuade her to tell us her thoughts on video about the 2009 Pinotage. Many thanks to Corlea and Petrus.